Our porous PTFE coated fabrics are manufactured from woven fiberglass substrates that have been lightly coated with PTFE. With only a minimal PTFE coating the material is porous and will allow products to cure and outgas through the fabric. Available in standard thicknesses of .003″, .004″, .005″, .006″ & .010″. Higher mil thicknesses are available. 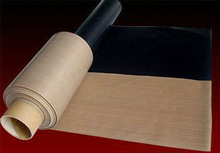 Typical applications would be composite mold release liners, curing rubber/sponge and a release cloth for filtration.